Summer arrived early in Finland this year. April was sunny, May was a bit sunny....but now the end of June is all cloudy and gloomy. But don't loose hope, summer will come back soon. Until then, we all need some splash of color and summer fun. What's more summery than watermelons?! 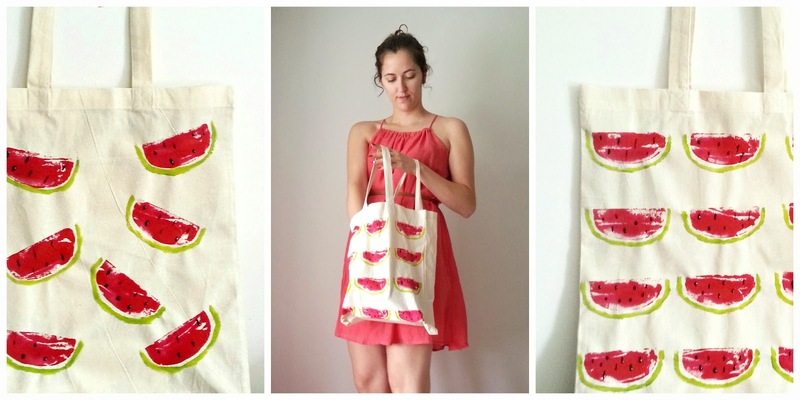 Here is a super easy and super cute tote bag for all the picnics and trips to the lake. - Put a newspaper inside the bag. You don't want to paint to go through and color the other side. You also prevent getting your table dirty. - Cut the potato in a half-moon shape. Apply red color and stamp the fabric with it. - With a thin brush paint the green line for the peel of the watermelon. - Use a toothpick to add the black seeds. - Let it dry. After ~30mins check that the newspaper is not stuck to the painted side of the fabric. - In 1-2 hours remove the newspaper. Let the bag dry overnight. - Iron it in high temperature (the setting of 3 dots on your iron) or according to the fabric's instructions. Follow Dimitra on instagram and have a look at her blog.